Our efforts in making sure the recorded content is clean and tidy! Proof-listening is a process where anybody who would like to volunteer with us can listen to the audiobooks and mark corrections. We have recorded all high school textbooks at the Wandering Minstrels Records and Studios, Bengaluru for the education of visually challenged students. Through this process of proof-listening, we aim to identify errors in our recording. The issues could include errors in pronunciation, noise, gaps, volume variation or omission of content. If you have excellent listening skills and a sharp ear to identify issues in Kannada pronunciation, you can volunteer, and proof listen. All you need is a laptop, computer or even your Android smartphone and most importantly the best of your Kannada listening skills! The process is straightforward. You listen to the recording, if you find errors, pause and comment at then continue listening further! Indeed it is that simple! 2. Kannada pronunciation is unambiguous! We only want to provide the cleanest of the language possible to our special students and nothing less! Kannada is a phonetically clear language. Each sound referred to as ‘phone’ and constructs have a clear and unambiguous pronunciation, and there is no scope for interpretations. Despite this, we tend to use the language loosely, and that might show up in the way we read. We want to make sure our recording is free of these issues. Here are some typical errors that we have found. There could be a lot more! Repetitions or words or phrases: repeated attempts to read the same sentence. Unnecessary content such as recording instructions a cough, sneeze etc. Reading pace if too fast or too slow. Published Karnataka Textbook Society textbooks are our proofing reference. We recognise that there are proofreading issues in the print version of the textbooks. However, we are not content creators or publishers. Hence, we always make sure the content is as close as possible to printed textbooks. Therefore, we appreciate your patience in proofing the recording against the published books. 4. How to get strated? Anybody who can plug their headphones and follow the text on the PDF either on a laptop or a mobile phone can get started and contribute. All you need is a sharp ear for clear pronunciation and spotting errors. You can proof-listen from any corner of the world and akin to our proofreading model, the work is accomplished in a distributed manner, making this the first formal distributed proof-listening initiative. We are also the first ones to do it on SoundCloud! 4.1. Where are the recordings? We have organised our recordings are SoundCloud. We have provided a textbook wise list at the end of this page for easy access. 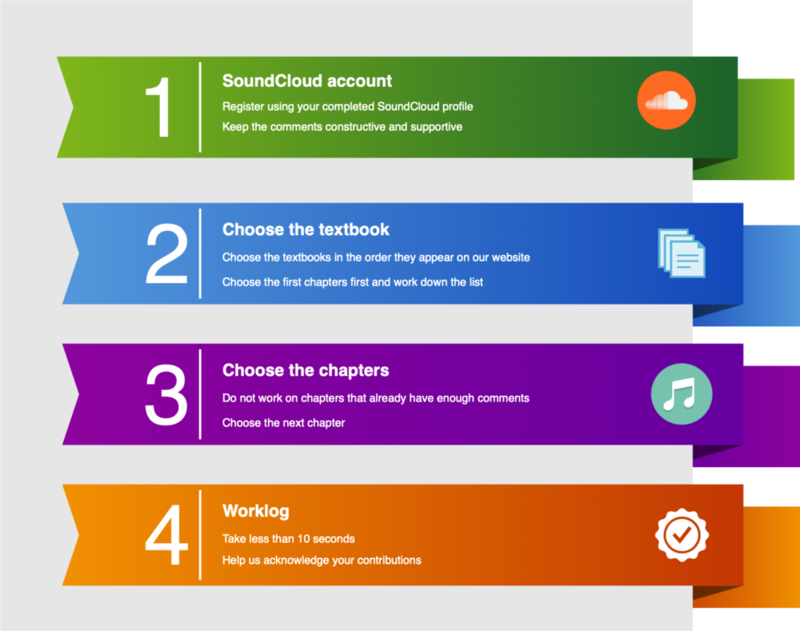 Each audio record will have one textbook chapter and the link to the original PDF of the content in the description of the audio track. You will need to listen to the recording carefully and proof it against the original text. All of us are volunteers. We did not have formal training in the studio recording, nor are we language experts. We have however taken utmost care and love in creating these recording. To ensure the quality of our final output, our volunteers have boldly come forward to get their record audited. Hence, we would appreciate it if your comments are constructive and critical. Be nice and lovely! 5. Why you should have a SoundCloud account? In protecting the interests of our voice artists and audio engineer interns, we will only accept comments and inputs from people who can create a clear SoundCloud profile and register with us. To record your corrections systematically, Use your real name on your SoundCloud account! We will only use comments from complete SoundCloud accounts registered with us. First, you need a SoundCloud account; please click on these two buttons in that order. Please make sure you have a SoundCloud link that bears your actual name. We recommend doing this on your Android phones as the iOS SoundCloud app does not support commenting on its app. You will probably have to do it in the browser. All you need to do once you figure out how to comment from your profile is play, listen against the PDF in the track description and follow it word by word. If you spot a mistake, pause, comment on what it is > what it should be. That is as simple as that. Several volunteers will be working down the list of textbooks and chapters, and it is possible you will find a recording with sufficient comments over the entire duration of the chapter as above. It is OK for another volunteer to proof-listen this chapter a second time, but let us not do more than two rounds of corrections. We recommend taking up 10th books first, 9th next and 8th towards the end. For simplicity, please follow the list in the same order and pick up anything that you think needs some more comments on them! After proof-listening, please fill in worklog. This will help us keep your contributions on record and duly acknowledge your efforts. Being a volunteering task, we offer you 1) acknowledgement on all the audiobook chapters you worked on as proof-listeners 2) Provide a certificate if you wish if it helps and most importantly 3) an opportunity to learn and polish your Kannada and listening skills. 9. What happens after prooflistening? Route 1: For the errors such as space, noise, continuity etc., our engineering interns will clean it up before we distribute the recording to special students. Route 3: For the content that has more issues than that can be corrected, we will archive the recording and re-do the book. After proof-listening and re-recording and rectification, the audiobooks will be syndicated or streamed freely across the platforms. We always believe in open source, content and we never sell our products. Therefore, you can be sure your contributions are slowly building this open online Kannada audio textbook library for the education of visually challenged students. Not only visually challenged, but these books are also of use for sighted children and special children with learning disability.